Welcome to Boston, Massachusetts, a quintessential blend of colonial history and cutting-edge innovation. 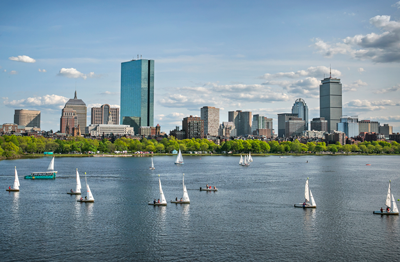 From the charming cobblestones of Beacon Hill and revolutionary landmarks of the Freedom Trail, to the iconic grounds of Harvard University and Fenway Park, Boston is a treasure trove of Americana. Please note that reservations at the Westin Boston Waterfront are now extremely limited. There are two hotels across the street from the Westin, and both are Starwood properties – Element and Aloft. As of 10 May, there are rooms available during the week of the symposium. There is no dedicated block of rooms for the symposium, therefore no special rate extended. The Renaissance Boston Waterfront Hotel is walking distance to the Westin, too. Hotels often offer reduced rates for pre-payment of your stay. Please pay attention to the details of these rates, as most are non-refundable as soon as they are booked. Situated in the heart of the city's up-and-coming Seaport District, The Westin Boston Waterfront is a dynamic destination from which to explore Boston. Settle into the AAA Four Diamond award-winning hotel and experience the benefits of a superb location, excellent amenities and thoughtful service throughout your stay. The Westin Boston Waterfront contains an impressive 793 guest rooms and is considered the most technologically advanced hotel in Boston. Guests can work out in the fitness studio, wind down in the hot tub, take a dip in the indoor pool, and even catch a performance at the hotel's Laugh Boston Comedy Club. A bar and restaurants serve everything from classic Irish to modern American, plus well-mixed cocktails. HOTEL REGISTRATION IS NOW AVAILABLE HERE. A block of rooms has been reserved for guests attending the 2018 symposium. The negotiated room rate ($229.00 per night plus 14.45% taxes - $262.09) will be available until June 11, 2018 or until the group room block is sold out, whichever comes first. A limited number of Government Rate rooms are available, but please be advised that upon check-in, you will be required to show your i.d. as proof that you’re eligible for the rate. You will be able to make reservations this link to the hotel - https://aws.passkey.com/go/4c3a55db - or you may call the hotel directly - +1-866-500-0167 - referencing this code - APS 2018. Averages for Boston in July. July is the warmest month of the year in Boston. The average temperature is approximately 80°F (that's about 27°C) during the day and only goes as low a 63°F (about 17°C) in the evenings. You can, however, still expect rain on an average of 10 days of the month. Please bring a jacket or sweater in anticipation of unpredictable hotel environments.